The end of the school year is quickly approaching and I am procrastinating on my revising for exams by writing about what I am really looking forward to: summer internships. As the try-hard and extremely nerdy student I am, I love looking for internships, as stressful as it is. Applying for internships starts way back in the winter, with that fun job search and constant wondering if you have enough qualifications. Last summer I participated in the W&M DC Summer Institute, which includes two weeks of classes in the William & Mary Washington Center office in the beautiful Dupont Circle, and then ten weeks of an internship. The internship, while semi-affiliated with W&M because students receive credit for their work, is entirely up to you to find and apply for. The Washington Center does a great job of helping students find internships that appeal to their areas of interest, but its really up to you to get the job. However, this summer, I have no William & Mary back up system and I’m charging into the work force on my own. I did learn some great tips about applying to internships from DCSI though, namely, apply to literally anything that is closely associated to anything you like. Last summer I applied to over 20 organizations and companies and ultimately heard back from four of them. The more you apply to, the more you’ll hear back from. It is pretty disappointing not to hear back from some of the places you applied to but life is life. So this summer I sent out around 10-15 resumes and cover letters and heard back from three. Which is great! Better than none at all. The worst part is scheduling interviews, being five hours ahead and on a UK phone plan leads to a lot of emails with times in EST and Skype usernames. For three interviews, Skype failed me and I ended up having to reschedule in order to make sure I could actually have an interview. One of the perks of the St Andrews Joint Degree Programme is that you have a very unique experience as a student. 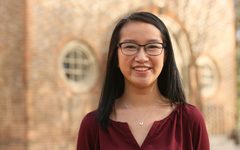 Going to William & Mary is prestigious in and of itself, and the bonus of also going to an international university while still maintaining your connections to Williamsburg gives you an added edge. Everyone will tell you to play up your strengths when applying to jobs and such, and name-dropping ‘Scotland,’ ‘St Andrews,’ and ‘two years abroad’ definitely impresses some people. Though it doesn’t apply to all things, for example, if you’re looking to research American public school education, as some St Andrews bloggers might be, it doesn’t have the same affect. Internships are a great way about finding out about what you’re interested in, and are worth the wait and stress. Even if you don’t get what you want, every experience working is still valuable. Plus you get to feel like a real adult, even while still not understanding how taxes work and getting nervous cold-calling real adults.